From the company that brought one of the leading coffee mixes in the country, GoldShine Pharmaceuticals has once again formulated a coffee mix that will surely capture the hearts of Filipinos. After Jimm's several years of success for its 3in1, 5in1, 7in1 coffee mixes, GPI finally launches their newest product called Cafe Clara. 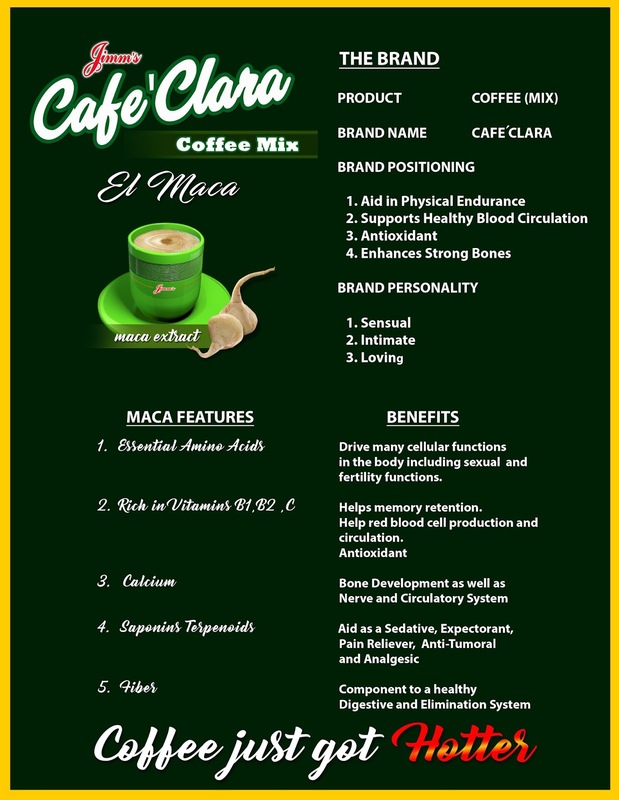 Cafe Clara is a coffee mix enriched with maca extract which is known to be highly nutritious and a great source for vitamins and minerals. Maca is also said to be a good source of carbs and protein, is low in fat, and contains a fair amount of fiber. What really makes Cafe Clara unique is its maca benefits that aids in physical endurance and improves sexual and fertility functions. Clafe Clara Coffee Mix is set to stir your ordinary cup into an intense and flavorful coffee that would make your day extraordinary! Non-dairy Creamer, (Glucose syrup, hydrogenated palm kernel oil, sodium caseinate, salt, stabilizer (Potassium phosphates), Emulsifiers (Mono and diglycerides of fatty acids), Anti-caking agent (Silicon dioxide), Refined sugar, Skimmed milk powder, Instant coffee powder, Maltodextrin, Maca extract and Artificial flavor.